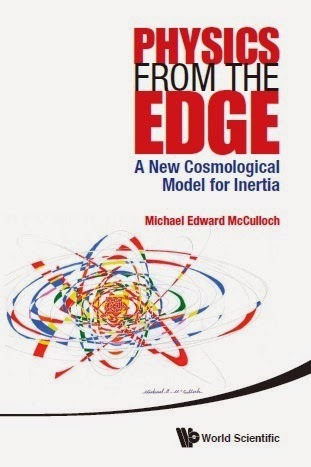 Physics from the edge: MiHsC: motion from logic. The advantages of MiHsC are that it is simple, it follows logically from very few assumptions and it predicts anomalies no other theory can without needing the infinite adjustability of dark matter (in fact MiHsC has zero adjustability). Understanding MiHsC is simple: consider an object, say Spock in a spacesuit, in a vacuum. Everywhere around him is the zero point field, a sea of virtual particles predicted by Heisenberg's uncertainty principle and whose existence Spock notes has been proven by experiments on the Casimir effect. Pairs of these virtual particles are always forming and recombining quickly. The zero point field usually has no effect on Spock in a vacuum because it is usually weak and uniform in space and so virtual particles bang into Spock from all directions equally so there is no net force. Now imagine Spock fires a back pack rocket motor and accelerates forward. He might then look behind him and tell McCoy on the static Enterprise that logically he can now never see things more than a certain far distance away because information from that far away traveling at the speed of light will never catch up to him as he accelerates. At this distance, then, is a horizon, which only exists in Spock's reference frame, so McCoy on a static Enterprise would look for the horizon, not see it, and tell Spock grumpily that he's getting carried away by his own logic again. Nevertheless, at that distant horizon virtual particle pairs that form can now be separated because one of them goes away from Spock and is lost forever behind the horizon and one will come towards him. The virtual particles that would have recombined, now never will, and Spock will see particles and radiation all around him: Unruh radiation, just like the Hawking radiation from black hole horizons, but caused by acceleration not gravity. Radiation is a kind of wave so its waveform must 'fit' exactly within the cosmos. Why? Well, because if the wave didn't fit exactly then it would go through the horizon and we'd then be able to know something about what lies behind the horizon, so it wouldn't be a horizon anymore. So some of the Unruh waves in front of Spock are disallowed by the cosmic horizon and disappear in a puff of logic and Spock raises his eyebrow approvingly. This is only a small effect though, and it makes a big difference only if accelerations are tiny, as they are at the edges of galaxies (this part of MiHsC correctly accounts for galaxy rotation without needing dark matter). Now behind Spock the waves must fit between Spock and the new horizon, which is much closer than the cosmic edge, so more waves are disallowed by logic behind him. This means more Unruh radiation hits Spock from in front than from behind, and this makes a force that opposes his acceleration and predicts the phenomenon we know as inertia (see the references below for more detail). This is the basis of MiHsC, & I think Spock would love it, because is shows how quantum mechanics (that provides the zero point field), relativity (that makes the horizon) and his beloved logic (that disallows non-fitting waves) can work together in a new way to make something as fundamental as inertia, and also solve a few problems that the old physics cannot. McCulloch, M.E., 2014. Physics from the edge. World Scientific.